One client has reminded Katy of Chichester Copywriter how satisfying it is to be involved with a marketing project every-step-of-the-way and to provide professional services across the whole spectrum of her marketing expertise, from copywriting for websites to providing professional letter templates. While Chichester Copywriter offers a broad range of marketing services, including: SEO copywriting, copywriting press releases and articles, copywriting blogs and news articles, social media marketing and marketing consultation it is unusual for clients to come along wanting the whole package, but not unheard of. However, in June, 2012, a Hampshire-based building company approached Katy to ask if she would deal with the whole shebang during an all-important brand re-launch and our creative copywriter jumped at the chance to be involved. 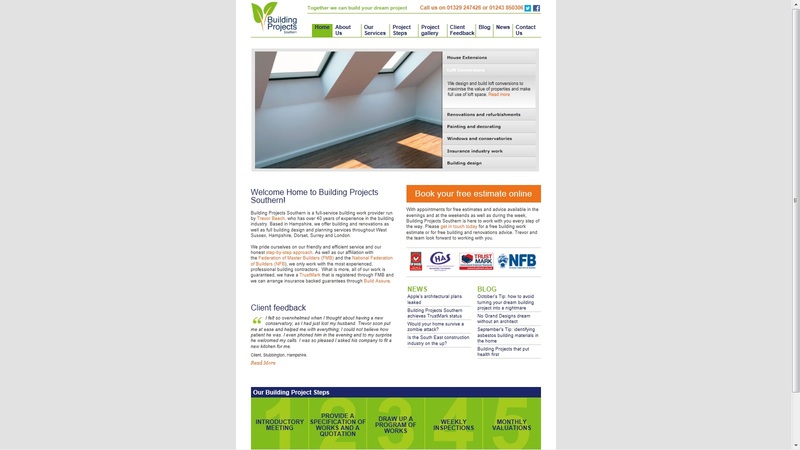 Trevor Beech of Building Projects Southern found Chichester Copywriter online and liked what he saw. Not only did he want Katy to complete the copywriting for his new website but he also wanted her to look after the social media marketing, provide regular news and blog articles and provide copywriting services and marketing consultancy for a number of other projects he had in mind. Once the website was launched in July, it was time for to concentrate fully on creating brand awareness and Katy did this by setting up, optimising and managing Twitter and Facebook accounts for Building Projects Southern. She also continued to contribute regular blog and news articles to the website to keep the content fresh and help the SEO along while working on a bit of PR for Trevor, namely getting him an interview on the most popular blog for freelancers, Freelance Advisor.co.uk. However, this project wasn’t just about online copywriting. Trevor also asked Katy to create professional letter templates –some that he could send to prospect clients and architects when tendering for work and others that he could send to existing clients when providing valuations, estimates and notice of final accounts. What’s more, Trevor engaged Katy to create an informative and persuasive flyer that he could send to prospect clients with the letters, detailing the accreditation of his company and associated contractors. “I don’t really want to write this, I want to keep her all to myself because she is that good. For more recommendations of Katy’s work please connect with her on LinkedIn or visit Chichester Copywriter’s testimonials page. To contact Katy about help with your own marketing project, no matter how big or small, please get in touch via our online form. This entry was posted in Chichester Copywriter's Projects and tagged Chichester Copywriter, Copywriting blogs & news articles, copywriting for websites, Copywriting press releases and news articles, copywriting services, creating brand awareness, creative copywriter, Facebook, Freelance Advisor, lime Creative, LinkedIn, marketing consultancy, marketing consultation, marketing expertise, marketing project, marketing services, news and blog articles, online copywriting, professional letter templates, proof-reading, SEO, seo copywriting, Social Media Marketing, social media marketing training, Twitter, web copywriting, website designer, Wordpress. Bookmark the permalink.